In my experience there’re two kinds of mountaineers: those who are aware of the fact that climbing is a spiritual endeavour and those who are not. If you want to climb Everest simply to pad your resume it’s not likely a good idea. If on the other hand you want to climb Everest to challenge yourself, to do something you are not sure you’re able to do or because you just feel compelled then it may be just the right goal for you. Once you’ve decided to do it you will need experience, good advice and patience. 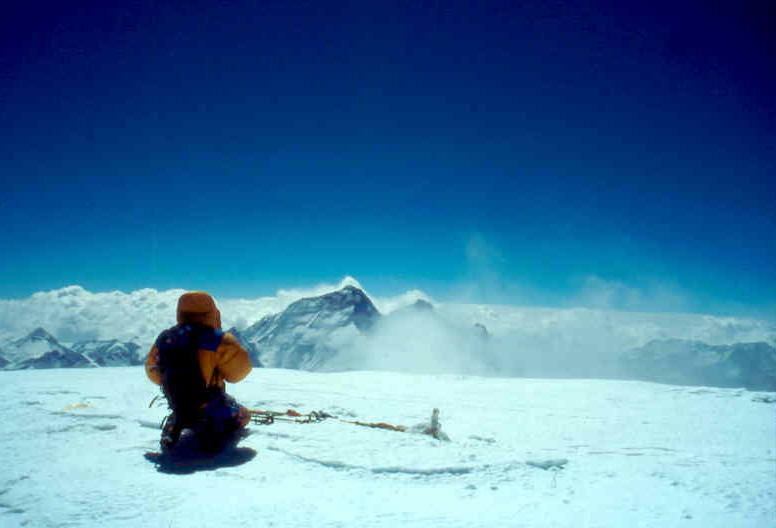 Looking towards Everest from the summit of Cho-Oyu in 1999. I started climbing about 25 years ago when I moved to Banff. A rock climbing buddy took me out to Cougar Canyon and introduced me to the sport. I immediately liked the challenge and the adventure that rock climbing presented. A few years later I became involved with a meditation centre that advocated physical activity and particularly endurance sport as an important facet of one’s spiritual life. Several members of the meditation centre where mountaineers and had just returned from climbing Denali in Alaska and Mount Logan in the Yukon Territory. This seemed amazing to me and I quickly began joining them on local trips to Mount Baker, Wedge Mountain and Garibaldi. We started ice climbing and the following summer began rock climbing at The Chief in Squamish. We struck out on larger expeditions to places like Paldor in Nepal and Huascuran in Peru. Concurrently I was doing alpine rock climbing trips to local peaks like Mount Slessie via the 27 pitch Northeast buttress and the Tuning fork on Mount Bardeen. All this diversity of climbing added up to a lot of experience. Getting lost in the mountains looking for routes, trapped in bad weather and personally experiencing severe altitude sickness. Looking back, I can say that there is no substitute for experience. If you’ve never been caught in a white-out at sea level how do you think it’s going to go at 8000m? I sometimes joke that fat old ladies can climb Mount Everest if the weather is good and they are well acclimatized. The problems always arise when things don’t go according to plan and that is when experience will be crucial. Eventually we set our sights set on Cho-Oyu; at 8201m, it is the sixth tallest mountain in the world. Three friends and I went and climbed the standard route on Cho-Oyu in 1999 with neither Sherpa support nor bottled oxygen. That trip helped me truly understand what altitude was all about. In order to save weight we did not bring sleeping bags with us to our high camp at about 7600m. All the way back from the summit of Cho-Oyu I was “falling asleep at the wheel” tired. Several years later we tried the steep and difficult Southwest face of Shisha-Pangma, the 14th highest mountain in the world (8012 m). We were unsuccessful there and it was a real lesson in group dynamics and proper planning. 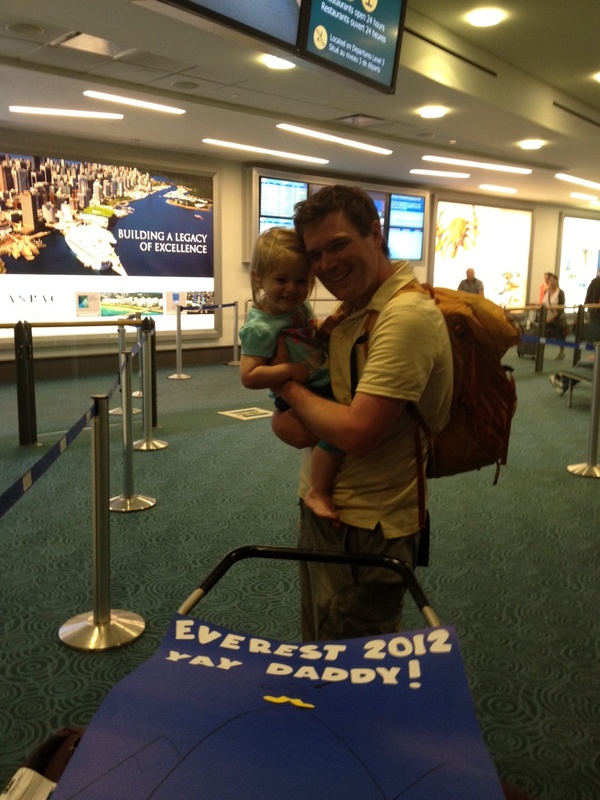 Want to climb Mount Everest safely and successfully? Get some experience. It wasn’t until 2009 that I finally booked a trip to climb Mount Everest via the North Ridge in Tibet. I was there with a good friend that I had climbed Denali with the previous year. He had tried to climb Mount Everest years earlier but had rolled his ankle making it impossible. The good luck for me was that he made very good friends with the logistics outfitter who was supporting the guiding operation that he had been climbing with. My climbing buddy’s personal relationship with the owner of the Nepalese expedition outfitter, Himalayan Guides, meant that not only did we get a great deal on our expedition (only 3 people on our permit) but also that we were treated like royalty by other expeditions’ support staff as a result of being “friend’s of Iswari’s”. We chose to hire three Sherpas to support us and to use bottled oxygen but were otherwise self-guided. The people you choose to hire to support you can make or break your expedition and I highly encourage you to seek out advice from people who have climbed on Everest about which logistics company to hire and who to avoid. Get a good referral to good people. I met one climber who died on Everest who I believe if he had better advice from his Sherpa support person he might still be alive. Get good advice. In 2009 I missed the weather window, the only one of that season, and I missed it by only a day. From advance base camp to the summit and return is about four days journey. A storm was forecast to arrive in three days. When I arrived at advance base camp for my final push. I sat in camp listening to my buddy summit in perfect weather. When I finally did head up to the high camps a meter of snow fell on us at the North Col (7000 m). The next day we pushed to get up higher on the mountain but high winds and deep snow made it folly. Two months and $25,000 later I had to turn home – this is where patience comes into play. After 20 years getting ready I was wise enough to not get myself killed and lose the chance to try again - not to mention the chance to see my family again. Be patient - the mountain is not going anywhere. 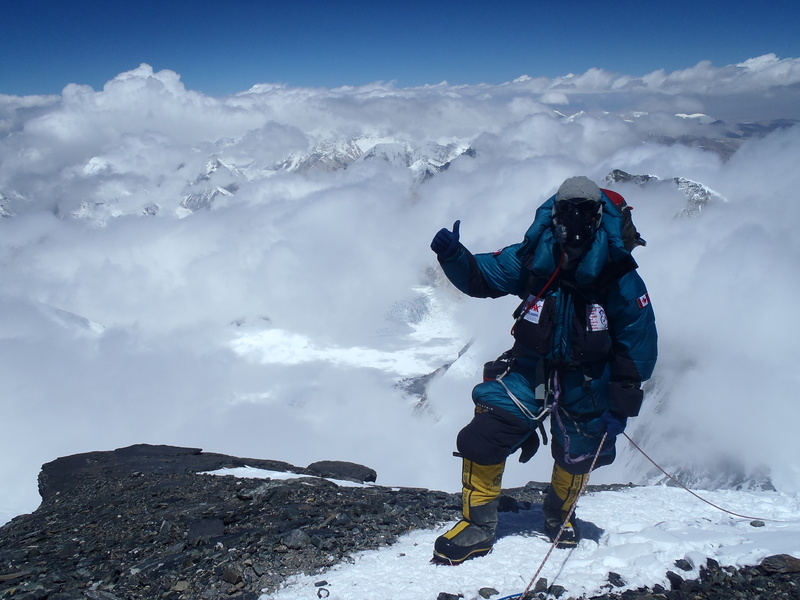 In 2012 I returned to the North Ridge and successfully climbed to the Summit at 6am on May 19. It was one of the most satisfying days of my life. All the way to the summit from our high camp at 8300m I was unsure of whether or not I would make it and if I had the capacity to do it. Getting to the top was great but the best part was actually coming down the Summit Ridge back to camp. It was there in the bright morning light, descending alone, that I had the deeply satisfying experience of mastery – of knowing I had been properly prepared and equal to the challenge. 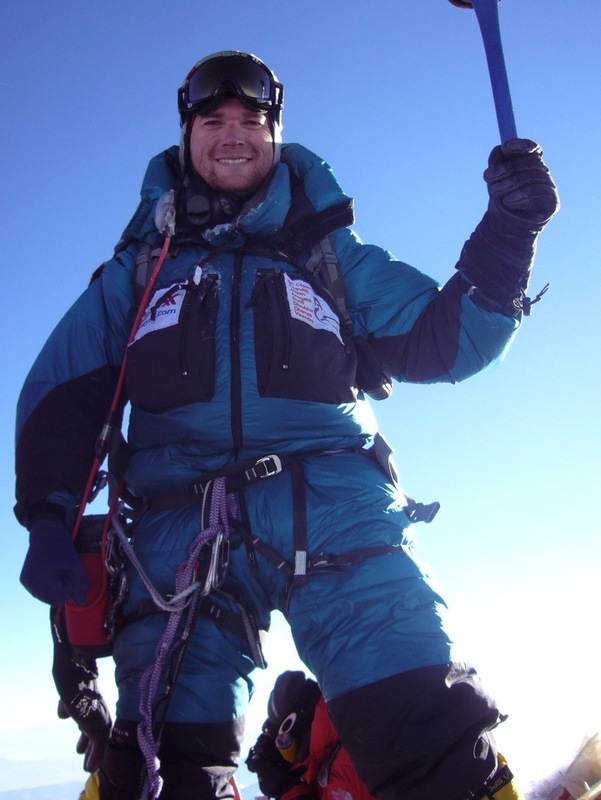 The hardest part of climbing Everest for me was the preparation and the journey past fear and self-doubt.